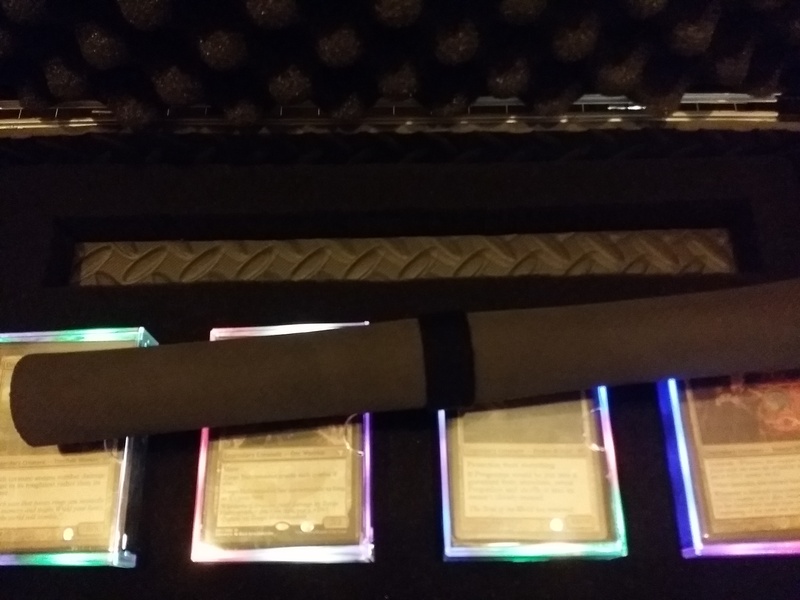 I’m a little obsessed with Magic: The Gathering. I do a draft every week, but my format of choice is definitely Commander. I used to bring one deck to my Friendly Local Game Store, but sometimes we just couldn’t find that fourth person. 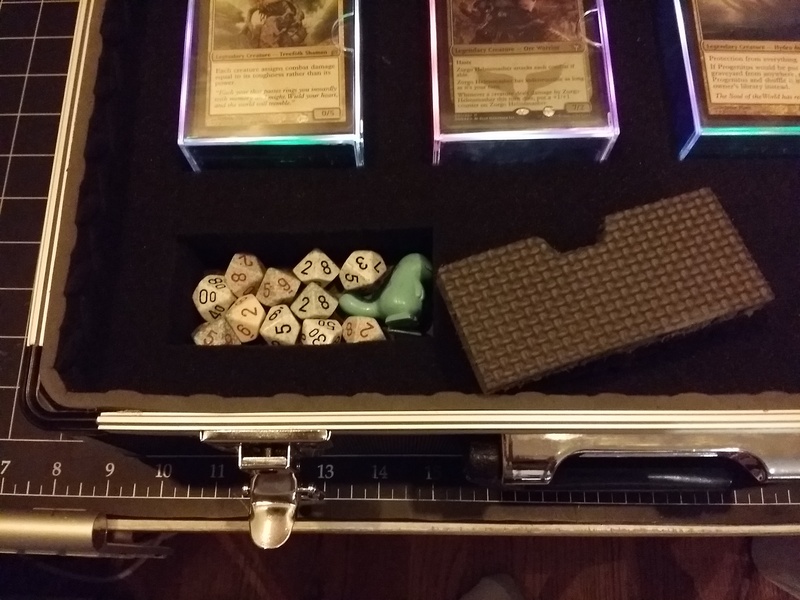 I started bringing more decks to loan out, and my little single-deck toolbox ran out of space. I needed something bigger. 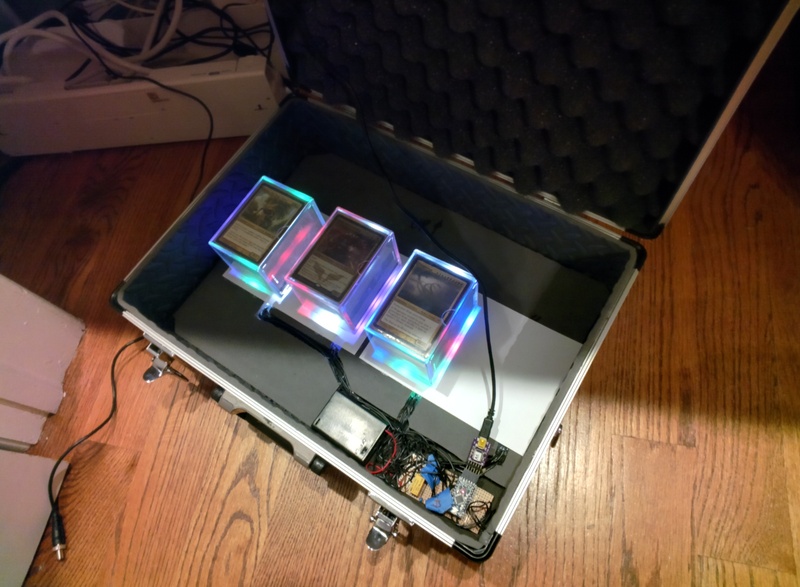 Sure, I could have bought an Ultra-Pro or filled a backpack with deck boxes, but I’m a hardware hacker, so I had to do it myself. It had to be based on the President’s nuclear suitcase because my decks are jam-packed with bombs. 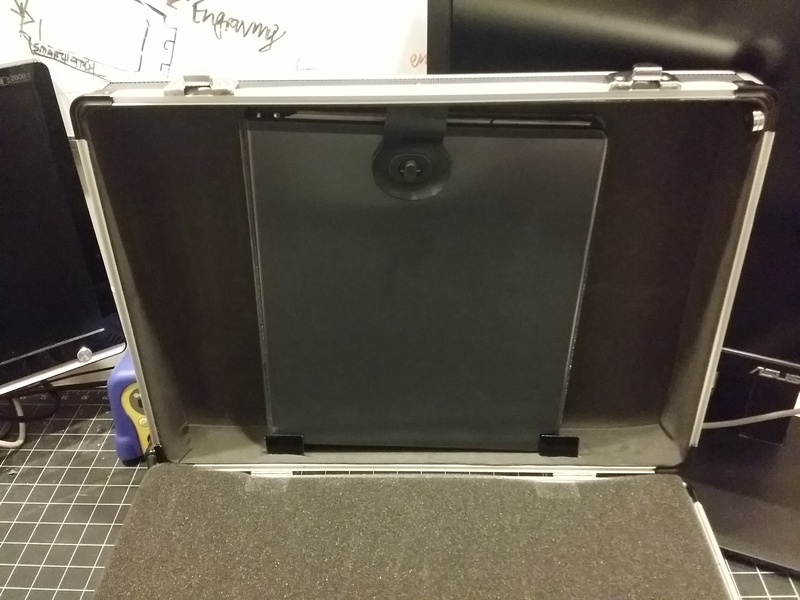 The box itself is a technician’s case from Harbor Freight that cost like $22. I like building hacks on top of cheap consumer goods – they’re made of cheap, easy-to-modify materials that give you a lot of flexibility. Each deck is illuminated from below with its color identity by sophisticated LED’s called WS2812’s. 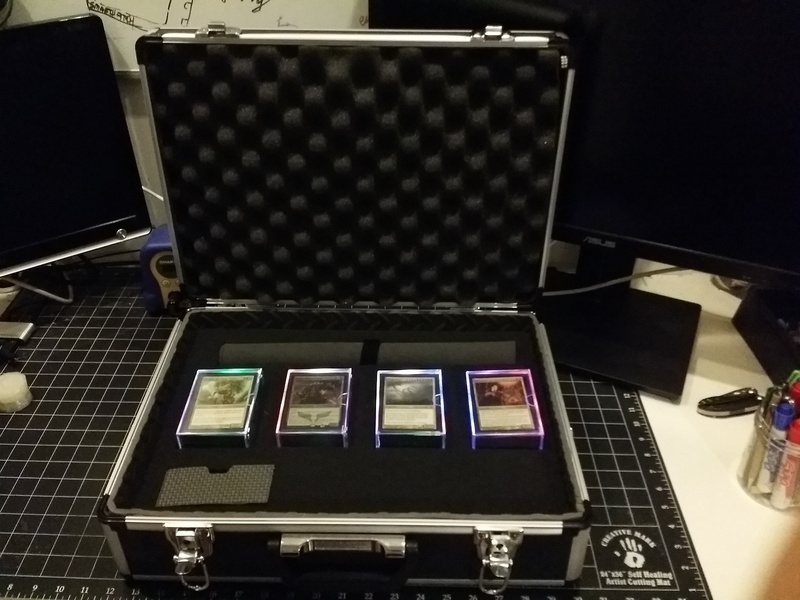 The briefcase senses a magnet in each deck and fades out the backlight when the deck is withdrawn. 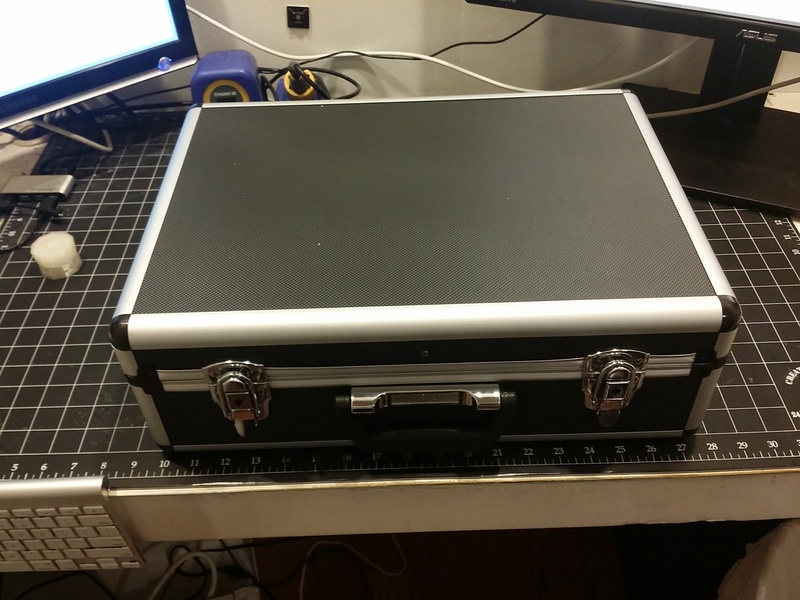 The lid conceals a built-in foam-lined dice box. These types of boxes usually have a plastic cup for the dice, but they rattle around and piss off the other players. The top slot holds a placemat because Local Game Shops are mad greasy. Pull back the eggcrate foam in the lid to reveal the hidden binder. Protect your stash! The electronics are hidden under the pick-n-pluck foam. It’s an Arduino that uses a relay to cut power to the WS2812 when the box is closed. The AA batteries will last for about six hours when the box is open, and for years when the box is closed. The project is open source, so feel free to rip it off! I’ll put the source code online soon! Thanks for reading, and if you’re in NJ or NY, let’s go to war! 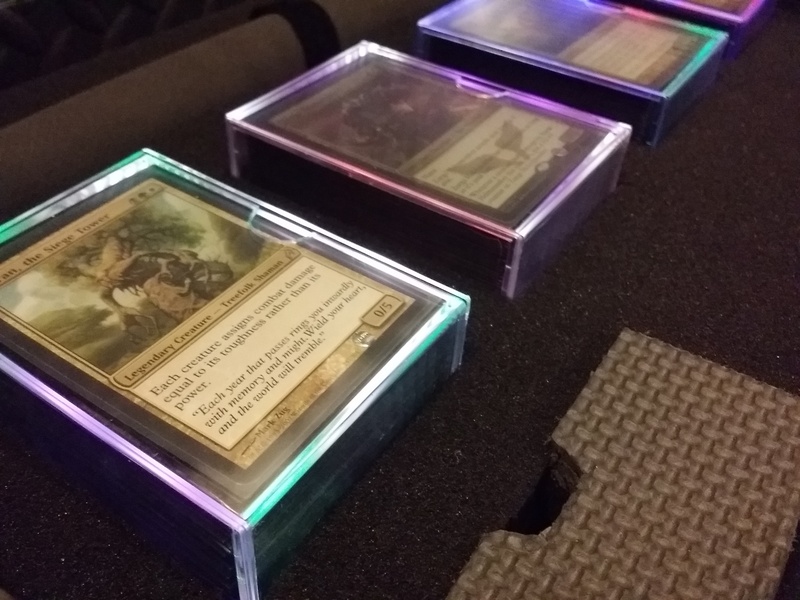 This entry was posted in Hardware Hacking, MtG, Swag by Yours Truly. Bookmark the permalink. I… NEED this. How much for you to make me one? Thanks man, but I would need to charge like $500 to make it worthwhile! You’re better off making one yourself! It’s a very straightforward project and the materials are easy to find. I hear ya… Mind posting instructions? I would also be interested in instructions. How did you do the magnet switches? They’re just encapsulated reed switches. You can buy them from any electronics supplier like Sparkfun, Adafruit, or Digikey. I soldered wires to their leads, and for protection, I applied heatshrink to the entire switch and leads. Then I just heated an old, unusable soldering iron tip and used it to melt a channel into the foam. I hot-glued the switch in place and covered it with the styrene diffuser sheet.